Save money on scrapbooking supplies at the craft store by shopping in Non-Scrapbooking Departments. Check out the rhinestones in jewlery. Use glue dots to adhere to your cards just like you do buttons. Speaking of buttons, the fabric departments sometimes have left over buttons on sale. A fabric store I visit occasionally has boxes of buttons to purchase for a nickel apiece. I also get my hemp twine from jewelry making department at Hobby Lobby. For inexpensive organza ribbon, go to the floral department. These ribbons are sold on the roll often for 50% off. (At Hobby Lobby, there are two locations for these - bridal and non-bridal). Ribbons without wire are best. If you do end up with a wire ribbon, be sure to trim the ends after tieing your bow no matter how pretty it looks. The tieing process pulls up the fabric part of the ribbon leaving little ends of wire hanging out that must be trimmed. Happy Tuesday! Thanks for stopping by! Embossing Powder: Gold from SU! 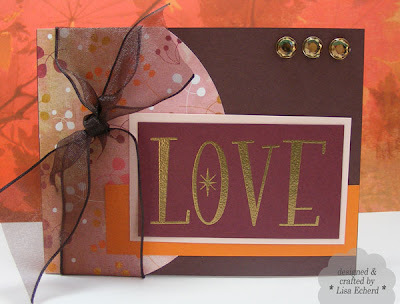 Cardstock: Choc Chip, Pumpkin Pie, Blush Blossom from SU!